We have noted here our desire to have an informative display whenever we are at a show or event. While we like the free-standing style displays we see at classic car shows, our budget is pretty modest. So we are searching for alternatives to the waterproof paper and magnets we have been using to display information on the jeep. We ordered seven magnetic car signs printed with the same information we had used on the paper signs. The goal is to answer the most commonly asked question of viewers if we aren’t around. In addition to the signs, we had a series of old ads copied and laminated, to replace the three framed ads that we displayed when we were with the jeep. Because the frames weren’t waterproof, we put them away when we weren’t around. 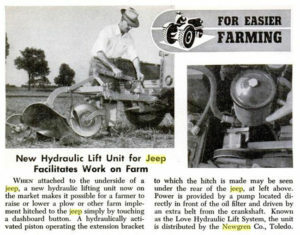 Finally we had a neat picture found on the Web blown up and laminated showing a jeep towing a baler and wagon. 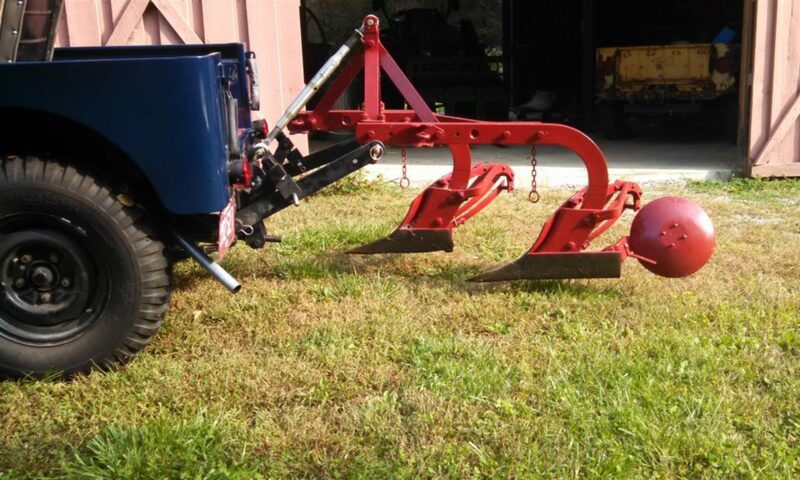 The picture is large enough to be seen from a distance and along with the plow, gives the viewer a quick visual clue about how the jeep was used. The display was well received and certainly an inexpensive move in the right direction. Viewers enjoyed being able to pick up and read the ads. The third day of the show was filled with periods of rain, then sun and the waterproofed display made our job easier. We weren’t scrambling to get items out of the wet. One of the joys of attending shows with the jeep is talking with people. 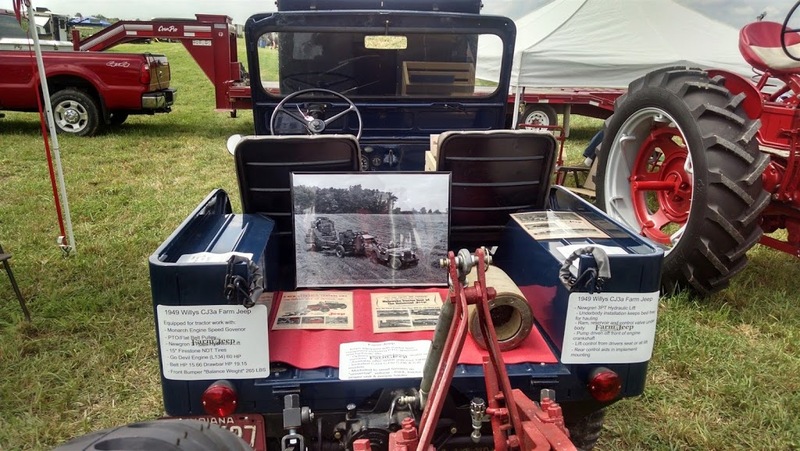 We always hear stories of childhood jeep memories and often find that we learn a little more jeep history. On the second day of the show, three gentlemen approached the jeep and headed straight to the engine. The three were recently retired from Stant, located in Connersville, IN. Stant, we learned, is the company that makes all sorts of automotive “caps” – radiator, gas, oil filler – and has done so dating back to the beginnings of the automotive history. The company made all the beautiful hood ornaments of the 1920s and 30s. The guys were looking at all the caps on the jeep to see if they where Stant products. Stant, they explained, made the L-134 oil filler cap/dipstick in a three step process, using a special rivet. They declared that ours was an original. The radiator cap was a Stant, but a modern version of the original. The gas cap was not a Stant and indeed had a bad gasket. We will need to work on that. It is clear that there is no interest in selling the jeep and we encouraged him to keep the lift on the jeep. We believe he will do so and look forward to helping him with the lift. 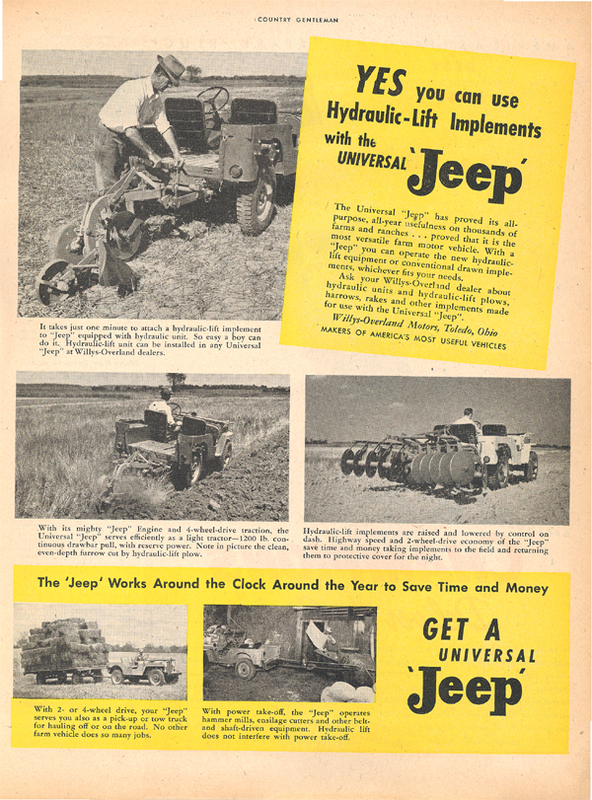 While looking over the ads mentioned above that we laminated, we noticed a strange statement on a January 1947 ad titled “YES you can use Hydraulic-Lift Implements with the UNIVERSAL ‘JEEP’. The statement – “Hydraulic-lift implements raised and lowered by control on the dash.” – got our attention. The ad, which can be seen here, shows the Newgren lift, that normally had the driver control between the seats. The Monarch Hy-Lo Jeep pump did use a through-the-dash control. 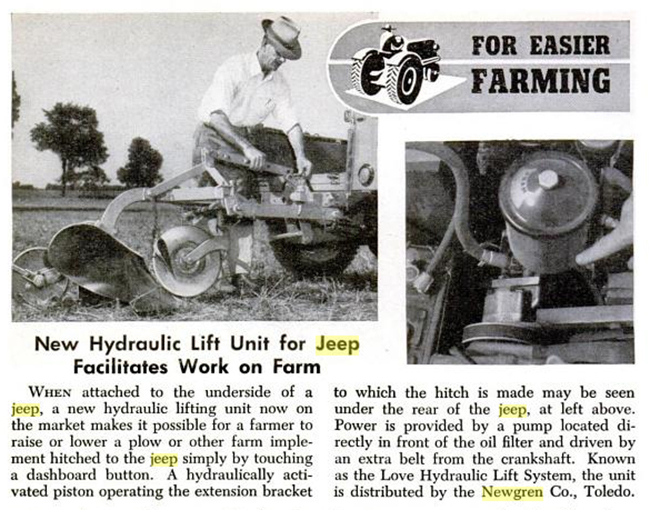 We know that the Monarch pump was used with some Newgren lifts, but we had assumed that was at a later date. 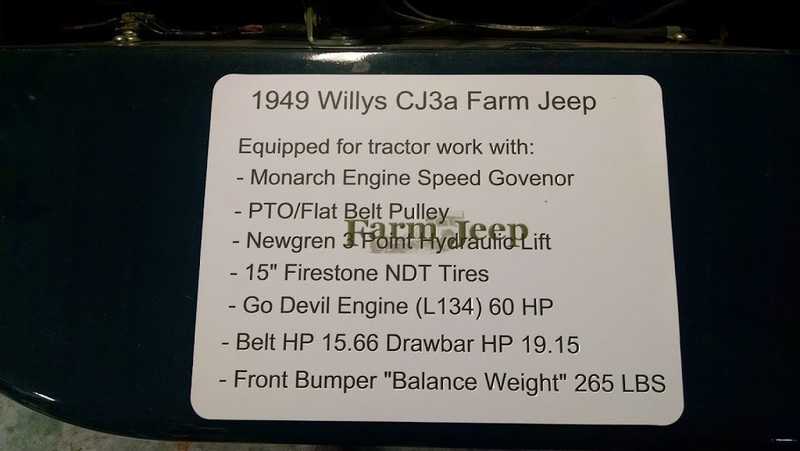 So the question was is this an ad misprint or had Willys (or Newgren) started using Monarch pumps in place of the original Newgren unit. The answer appeared as we were reviewing the information we have on the Love lift. As can be seen when comparing the ad above to this newspaper report (thanks to ewillys.com), the photo is the same. Our assumption is that the lift in the ad was a Newgren was our error. The earliest Love lift did use controls on the dash. 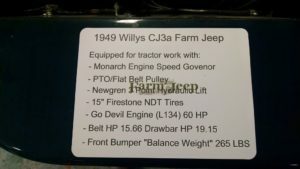 Next PostNext Can I build a farm jeep using my Wrangler?